The Vinci family knows the inner workings of the vacuum cleaner· industry. Three generations – grandfather, father and son – have made their living selling vacuum cleaners. The family got into the business in 1946 when Benjamin Vinci went door-to-door’ selling Electrolux cleaners in his New York hometown. 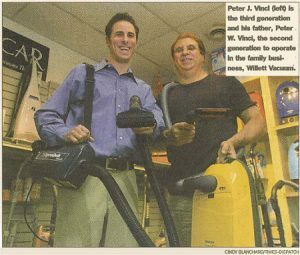 Twenty-two years later, he and his wife opened Willett Vacuum in Port Chester, N.Y. Peter Vinci helped his father out in the family business, although his first love was baseball. He was scheduled to report to the Kansas City Royals baseball camp after graduating from high school when he injured his leg. At the same time, his father a World War II war hero who had been shot at Pearl Harbor, became ill, prompting Vinci to assume responsibility for the store. The company specialized in Electrolux but sold several high-quality lines of vacuums. Wanting to expand the business, Vinci opened a second store in Larchmont, N.Y.
Today, Vinci’s brother, Joseph, owns both New York stores. A while after opening the second store Peter Vinci decided to move south to a better climate and a lower cost of living. Vinci opened Willett Vacuum in Richmond in 1991 at 8422 W. Broad St. He now works side-by-side with his son, Peter J., who also grew up in the business. The youngest Vinci started “working part time for his dad when he was 15. 1 would help with repair work and some sales,” he said. “I also helped a little with advertising ideas, price marking, etc.” By the time he was 20, Peter J. Vinci, who had been attending Virginia Commonwealth University, returned to New York to run the Larchmont store. Vinci fashioned the Richmond store after its New York counterparts, bringing in merchandise that was popular in the Northeast. “I brought in lines that people here had never seen like Miele,” Vinci said. Today, including Miele, he store carries brands such as Riccar, Panasonic and Sanyo and sells to residential and commercial customers. After running the Larchmont store for five years, Peter J. headed back to Richmond in 1996 when his grandfather became gravely ill. Peter Vinci was traveling back and “forth to New York to be with his dad, who died in 2002. Mark Piepes, owner of Desco Vacuum Supply in Linden, N.J., remembers how Vinci and his family cared for their ailing father. Vinci recalls that the Richmond store started out slowly. “It was a gradual process of building business,” he said. Peter J. agrees. “We tried to be very customer service oriented and carry better products than you find at other places,” he said. When he opened the Richmond store, Vinci hired Roger Newman to ‘work part time with the family. Newman, who, is blind, had worked in the industry before. Customer Domenic Romanello saw the Willett Vacuum sign as he was driving down Broad Street. The name stood out because Romanello had grown up in Port Chester and was familiar with the town’s Willett Avenue. “I had a vacuum serviced there and then decided to buy a new vacuum,” Romanello said. “I’ve bought several vacuums from them,” he said. Ray Buttermore has been shopping at Willett Vacuum for 11 years. During that time he’s purchased six vacuums for himself and others. “They are really great people. They know the business,” he said. The field is competitive, he added. “People think we are just trying to sell a product because that is the only product we carry. But we pick that product from “everything that is manufactured. Trade Names is a regular feature about established Richmond area businesses.